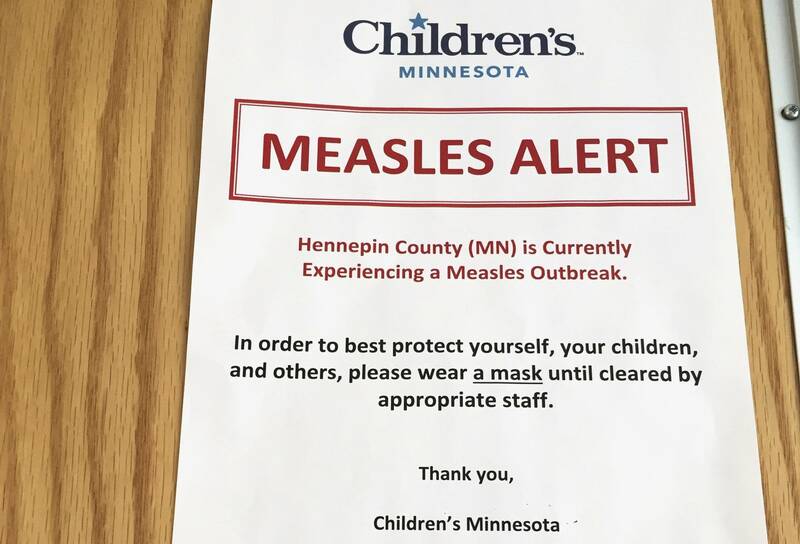 Minnesota health officials say the number of measles cases rose by four over the weekend and the highly contagious disease has now moved into a southern Minnesota county. Two new cases of measles were discovered in Le Sueur County, the Minnesota Department of Health reported Monday in its daily measles tally. Officials say those cases are related to cases in Crow Wing County in central Minnesota that made their way there from the outbreak in Hennepin County. They know now of 58 cases — 55 are children — in the biggest outbreak of measles in Minnesota since 1990, when measles sickened 460 people. Three children died in that outbreak. Health officials say most of the cases in this outbreak are concentrated within Hennepin County's Somali-American community and involve people who were not vaccinated against the disease. There are three cases in Ramsey County, four in Crow Wing County and two in Le Sueur County. The Crow Wing County cases raised a warning flag for Minnesota health authorities worried the circle of people exposed to the disease is widening. Officials have called on people with measles to voluntarily avoid contact with other people for 21 days. If that doesn't work, the state can get a court order to quarantine people within their homes, although officials last week stressed there were no cases currently where quarantine is being considered. Health care providers are urging anyone who suspects measles to call ahead so they can be ready to accept and isolate potential victims of the disease. While Somali-Americans have contracted the vast majority of the cases so far, the problem goes beyond that community, said Kris Ehresmann, the state's director of infectious disease control. "It's a reminder that, parents if you haven't gotten your kids vaccinated if you haven't followed up on that, you need to be thinking about this because this isn't staying in one community and it's not staying in one place," Ehresmann added. "It's spreading across the state."